The international FOKUS FUSECO FORUM (FFF) series represents a follow-up to the famous international FOKUS IMS Workshop series held from 2004 to 2009, which discussed the beginning of fixed-mobile convergence (FMC) in the light of emerging 3G/UMTS networks and Next Generation Networks (NGNs) and the related challenges and opportunities for new business models and technology evolutions towards the IP Multimedia System (IMS). However, within the FFF series IMS and related web-based multimedia technologies represent just the foundation for seamless human-to-human multimedia communications such as Voice over LTE (VoLTE) and Rich Communication Services (RCS) within the overall converging wireless telecommunication and Internet infrastructure. So in 2010 we saw the rise of 4G/LTE networks and new paradigms like the Future Internet, Smart Cities, the Internet of Things (IoT) and Maschine-to-Maschine (M2M) communications that led to an even more comprehensive and challenging convergence of ICT platforms and related technologies, resulting in bigger changes in the networking world by the "softwarization“ of networks. Thus, in 2010 we started to shift our focus towards flexible core network provision and cloud-based service platforms for both multimedia and M2M applications above emerging 4G/LTE networks and renamed the IMS Forum into Future Seamless Communications (FUSECO) Forum. With the definition of the requirements for the fifth generation mobile network in 2015 by the NGMN Alliance it became clear that 5G will be much more than just a new mobile network generation. 5G will be based on all previous advances in networking and IT innovation and mainly represent an agile software-based network and service platform for the deployment of innovative - mainly IoT and broadband multimedia - applications on top of fixed and mobile access network technologies. So 5G will represent the ultimate convergence environment. In 2015 the sixth FUSECO Forum already discussed with leading technology experts how 5G and the latest developments for the optimization and virtualization of the network, new paradigms like Software Defined Networks (SDN), Network Function Virtualization (NFV) and Mobile Edge Computing (MEC) are interrelated and how they could be used for the efficient and secure provision of IoT and Industrial Internet applications. Based on our engagement in international 5G research projects it is clear that 5G will be introduced in an evolutionary way and 5G will become reality long before available standards in the next years. The new 5G Berlin initiative can be regarded as evidence that 5G will be around soon. The 7th FUSECO Forum labeled “Getting ready for 5G“ continues the successful FFF series and will center around these exciting global developments and will take place November 3-4, 2016. This time FFF16 will be even more focused on emerging 5G killer applications and enabling technologies. 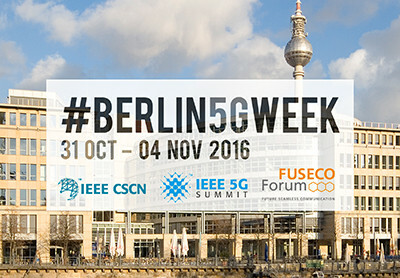 For the first time ever FFF will be run within the #Berlin5GWeek together with the IEEE CSCN and IEEE 5G Forum to allow leading experts of these related fields to exchange their experiences and discuss their visions in one single place, namely the vibrant 5G City of Berlin. Following our successful two-day event structure we will provide on Day 1, in the morning, three tutorials that introduce the 5G access network evolution towards massive MIMO and core network evolution towards fully softwarized 5G network and service platform, driven by SDN, NFV and MEC, as well as a detailed perspective on IoT/M2M, Data and Cyber-Physical Systems for the Factory of the Future, Industry 4.0 and Smart Cities. In the following three interactive afternoon workshops international manufacturers and operators will discuss the challenges and opportunities of "Future 5G RAN Technologies“, "Software-driven 5G core and service platforms“ and "The Rise of the Industrial IoT". A social event in the evening will enable delegates to continue technical discussions and come to know each other in a unique location in Berlin that attendees will not forget. On Day 2 we will run the international conferences where global analysts, standards bodies and operators will report on the recent experiences and expectations around 5G, SDN, NFV, MEC and 5G applications in the fields of IoT and the Industrial Internet from a global perspective. Alongside this program and during the breaks, the attendees will again enjoy the exhibition of our sponsors and the newest FOKUS OpenXXX toolkit demonstrations. Whether you are already part of the FOKUS family or whether you may plan to visit us for the first time, I am convinced, that you will enjoy two very interesting days in the vibrant city of Berlin where you will gain new insights, have interesting expert talks and make new friends from all over the world. I trust you will find this program interesting and hope to see you at our seventh international FOKUS FUSECO Forum in Berlin, Germany, November 3-4, 2016.